Hold Pages Up to 8.5 x 11"
The Safe-T-Binder Without Rings from Vue-All will hold up to 8.5 x 11" photographs, negative pages, and documents, preserving its contents from unwanted damage and outside contaminants. The binder has a white textured finish and it is made from an archival quality ridged polypropylene, which contains no PVCs. This makes the binder suitable for long-term storage. The binder has two snap locks with flexible hinges and is dust- and moisture-resistant once closed. 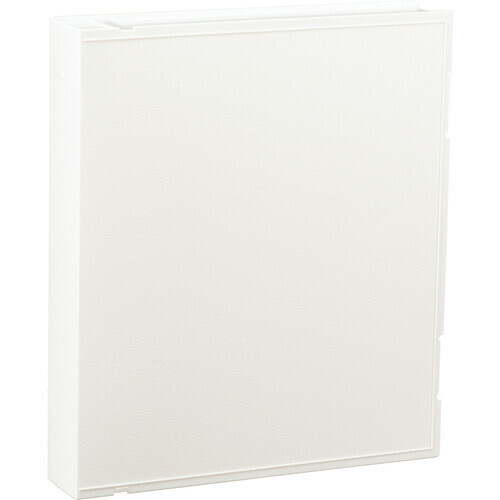 Box Dimensions (LxWxH) 12.3 x 10.7 x 2.25"
Safe-T-Binder Without Rings (White) is rated 4.2 out of 5 by 6. Rated 3 out of 5 by Anonymous from GReat binder This is a great binder, it is slightly hard to open but serves its purpose. No rings inside so make sure it is the one you want! Rated 5 out of 5 by csundt from Best film storage I can find These binders allow for dust-free storage, keeping film safe for transporting, but most importantly, the lack of binders opens the possibility for a more varied selection of film sleeves. This is important if, like me, you use a number of different manufacturer's sleeves for various film formats. Rated 3 out of 5 by Anonymous from A bit tight I got it to store my Printfile negative sleeves. It works, but it isn't quite big enough for the size of the sheets. They fit, but tightly. Otherwise, it's sturdy and serves the purpose. Rated 4 out of 5 by i3c from Does the job I use these to store old 8x10 transparencies. A reasonable solution that's not too expensive. Rated 5 out of 5 by Naturelover from This I couldn't live without! Keeps negatives and prints safe, clean, and dry. Rated 5 out of 5 by Anonymous from Good product Good storage folder at a good price. how deep are these boxes? I'm not sure and can't measure mine b/c I am not at home but I would guess they are about 1.75-2 inches deep. What about same box with rings ? I use the box without rings for a project I'm working on. I have not, as yet, had need for the one with rings.